Nikon India today announced the launch of the D5200 D-SLR camera, a compact and lightweight entry-level model that delivers exceptional performance via Nikon's all-new DX-format CMOS sensor, which has an effective pixel count of approximately 24.1-million pixels. The Nikon D5200 will be available from December in three colors — black, red and bronze at MRP of Rs. 46,950 for D5200 body and AF-S DX NIKKOR 18-55mm f/3.5-5.6G VR Kit Lens. D5200 allows photographers capture images with the swing-out-style Vari-angle LCD, making self-portraits possible. It flaunts a number of advanced features such as 39 focus points, Scene Recognition System, i-TTL balanced fill-flash and auto white-balance control. Equipped with D-Movie function, the camera supports recording of full-HD 1920 x 1080 50i/60i movies for sharp HD movies exhibiting excellent detail. The D5200 has the ability to connect with smart devices via the Wireless Mobile Adapter WU-1a, or be remotely controlled via the new Wireless Remote Controller WR-R10/WR-T10 (both available separately). Nikon D5200 is also equipped with Special Effects mode that enables the application and adjustment of special effects while shooting. This makes recording of original and creative still images and movies that combine the superior definition of the high pixel count with a variety of forms of expression simple and fun. The camera also sports a broad range of standard sensitivities, from ISO 100 to ISO 6400, with even higher available settings; (Hi 2) is equivalent to approximately ISO 25600. The camera possesses greatly enhanced optical technologies, including an optimised Expeed 3 image-processing engine. 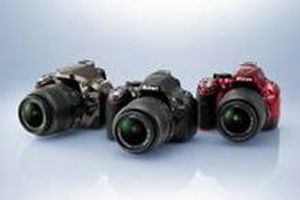 Speaking on the announcement, Hiroshi Takashina, managing director, Nikon India, said: "We have specifically designed this new D-SLR to provide users with excellent performance that can be achieved by other higher-end models. With this launch, the consumers will now be able to capture highly flexible image expression, and reliability that ensures beautiful pictures." "The D5200 is a versatile and compact D-SLR that is well suited for photo-enthusiasts looking for high-end features and full HD video with selectable frame rate of 60i-24p." said Sajjan Kumar, vice president - imaging, Nikon India.